Within the walls of the World Crown Sports gym is a close-knit group of talented Hispanic fighters from all over the world, figure-headed by middleweight champion Sergio Martinez, but all of whom swear their devoted allegiance to their entrenador, Gabriel Sarmiento. 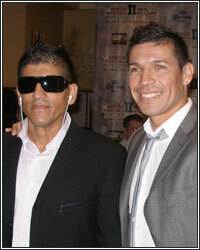 Sarmiento has made waves among the boxing community with the huge success of his protégé, Sergio Martinez, who he cultivated over the past nine years since he took him under his wing. Sarmiento's fighters are all well-disciplined. Despite competing among various weight classes and in different stages of their training, they are all kept in brilliant fighting shape throughout. His focus on strategy and ring generalship has made him a sought after tactician for fighters looking to improve their boxing IQ. It was ten years ago after a knockout loss to the then-unknown Antonio Margarito that Martinez hired Sarmiento as his trainer, and not surprisingly, Sarmiento thinks a rematch against the Tijuana Tornado would go much differently. "Margarito isn't even that good of a fighter, he isn't even close to being on the same level as Martinez. That fight wouldn't go past five rounds at most," he would tell me as he took time out of his busy schedule to speak with me when I visited the trianing camp of middleweight champion Sergio Martinez.